CAG in Translational Hematology - Improving the outcome of treatment for patients with blood cancer. The vision of CAG Translational Hematology is to improve the treatment, quality of life and survival for patients with blood cancer. The focus is initially on acute myeloid leukemia (AML) and myeloid dysplastic syndrome (MDS), with the aim to expand the research to other types of blood cancer. Our specific aim is to identify and target blood cancer stem cells. To do this, we have established a platform which enables comprehensive drug screening, which is an important tool to identify the best available treatment for the individual patient, also called precision medicine or personal medicine. 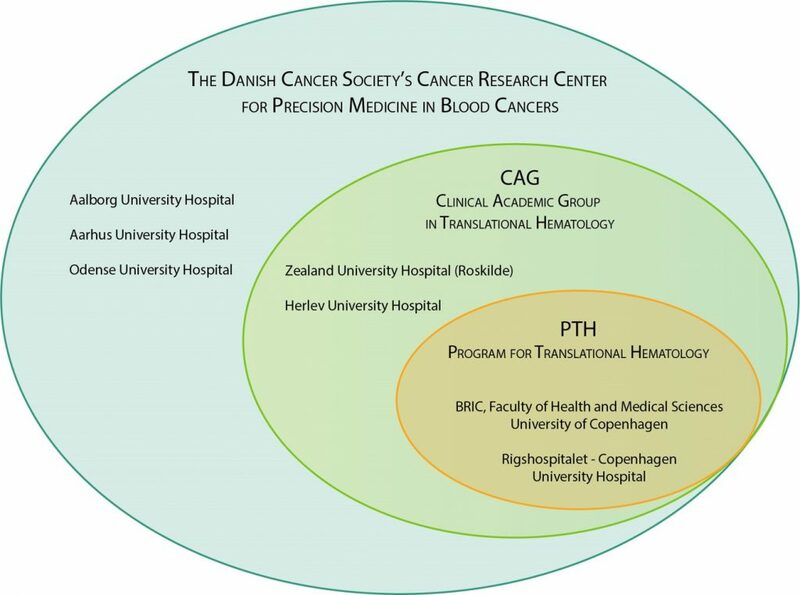 CAG Translational Hematology was established on an ongoing collaboration on the project ‘Program for Translational Hematology’ (PTH) between leading basic and clinical researchers in the field of blood cancer from Biotech Research & Innovation Centre (BRIC) at University of Copenhagen, Finsenlaboratory, DanStem and Rigshospitalet. At the establishment of CAG Translational Hematology, the collaboration was extended to include the hematological departments at Herlev and Zealand (Roskilde) University Hospital. Most recently, a grant from the Danish Cancer Society, made it possible to further expand the collaboration to include the hematological departments in all the regions of the country from January 2019. The national collaboration is anchored in the Cancer Research Center for Precision Medicine in Blood Cancers, and the goal is to ensure equal access to personal medicine for all the patients in the country. In CAG Translational Hematology we will work on improving the translational education and further education of the next generation and present clinicians and scientists in the field of blood cancers. This we will ensure by including PhD and PostDocs in the various collaborations and offer different courses and workshops. The overall goal is to ensure the best possible treatment for patients with blood cancer.